Many people build custom homes in a particular location and in a particular architectural style to deliver the home of your dreams. Maybe it’s a cabin in the woods. Maybe it’s a beach home. Maybe it’s urban net-zero home build with a rooftop deck. Once you have the building lot and a feel for the general style and orientation of the new custom home, then you’ll quickly start to transition to the interior design and home building materials. The number of options can quickly overwhelm the home buyer who doesn’t recognize how involved the decision-making process can get. Here, it can be helpful to narrow down the options and refine your thinking about home design and interior furnishings by surveying popular materials and design trends for custom home builds. Easier said than done. After all, custom homes are, you know, customized. To wit, I’ve tried to research, organize, and present these ideas in a way that you can adopt as your own. While this guide is a few years old now, I still think this overview of custom home building trends from D Magazine is holding up well. Lots of large windows seem to be the new perennial exterior design element. 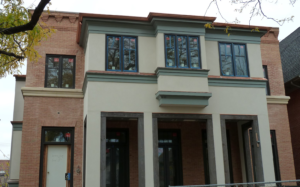 Traditional facades are still popular, but marrying these two features together isn’t easy. The larger principle, to my mind, is to think of clean, simple lines that can put the focus on a single feature with a more elaborative flourish. On the inside, subway tile, hardwood, and natural stone are popular materials. For decorating, the desired vibe is contemporary without being stark and without being afraid of splashes of color, including brass and gold. This is one of the most common things people are looking for in a new custom home. They don’t just want a dream home; they want a guilt-free custom dream home that is environmentally-friendly. Sustainable homes can be measured in a couple different ways. There are Net Zero Energy Homes that produce at least as much energy as they consume. There are also more or less sustainable building materials. Sustainability-minded builders tend to choose natural materials, not foam, for their insulating materials. Exterior and interior surfaces can be made from recycled or salvaged materials. But even raw materials can be chosen with the environment in mind. Quick-growing bamboo is a more renewable resource than ancient hardwoods and oil-based plastics. Not all custom homes are multi-million dollar mansions. In fact, some custom home buyers are working with tight budgets when choosing home materials, but they know what they want and can’t find it in the existing housing stock. Concrete, stone cladding, and reclaimed materials from timber to corrugated metal to industrial steel. Most often, people find a low-cost option for their exteriors—concrete, stone cladding, and reclaimed materials from timber to corrugated metal—while going balls to the wall with their interiors. Some are true concept homes that can be built from shipping containers, natural landscaping features, and other found and repurposed materials. There are so many different variables that determine how much a new home costs that there is no single definitive average that can be easily cited. Almost everybody contextualizes their cost information for a specific type or cohort of home buyers. From custom home build to residential tract development to prefabricated homes, the average cost to build a home can vary by a few hundred thousand dollars or more. If you have a finished lot available, if you’re planning on building in an easily accessible area for crews and equipment, if you’re building in an area with affordable home values, if you need only and if you’re willing to choose budget-minded furnishings, then a new home build might be very reasonably priced, even less than $100,000. If you’ve reached a place in your life and career where sticking to a tight budget is less of an issue, if you’re excited about building a custom luxury home with more than a few bells and whistles, if you’re planning on hiring an architect, if you’re planning on in the middle of a trendy neighborhood or out in the middle of nowhere, then the expected cost could be several hundred thousand or even several million dollars. Here is what the home building industry says about average costs. If there were a definitive statistic to cite, it would probably be $290,000. This is very close to the number suggested by HomeAdvisor, an online company that actively tracks the costs of actual home builds that go through their marketing network. Many online industry sources take their cues from HomeAdvisor, so you’ll find this $290K number pop up other places as well. I’ve seen sources that suggest the average home is 2,000 square feet with construction costs of $150 per square foot. If you’re looking for a breakdown of how this money is typically spent in an average new home build, The Lenders Network has reverse-engineered this figure into a fairly comprehensive analysis of home building component costs. 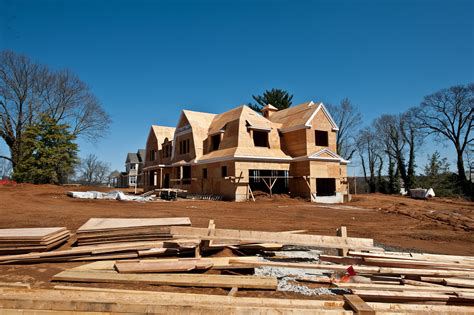 Looking for a different approach to cost estimates that’s better suited to custom home builds? There’s a good chance, for example, that your dream home is bigger and swankier that these average figures. In fact, the average size of a new home is now around 2,600 square feet, to say nothing of custom home builds. CostHelper suggests that the average custom home is more like 3,600 square feet with upscale construction costs between $200-$400 square feet. This makes the average cost of a custom home somewhere between $700K-$1.4M. Maybe you’re not trying to settle on a number just yet, but would prefer to learn more about the step-by-step process of creating a budget and cost estimate for your custom home build. I encourage you to peruse the tips and advice on this website and start reaching out to architects and builders in your area. Selecting a general contractor is one of the most important decisions you’ll make during your home renovation. This individual will oversee much of the building process and consult you on every decision throughout the experience. As a result, finding a general contractor that shares your vision is of the utmost importance. To that end, you should also find a professionally equipped contractor. Here are four tips to set you in the right direction. Only consider contractors who are licensed, bonded, and insured. This is a basic necessity, but it is important enough to mention it here. A contractor who is licensed, bonded, and insured is also reputable, professional, and proactive. Don’t settle for anything less. If references aren’t actively advertised on a contractor’s site, ask them for a handful of contacts. Speaking with prior customers is an absolute necessity, as these people can testify to the overall experience of working with the professional. You’ll have a better understanding of their personality, the cost, and the quality of their work. If you’re lucky, you might even be able to visit a home the contractor built. As a note, if your contractor has no references or refuses to provide them, consider another option. This is a big red flag. If your contractor has a warranty, they stand behind the quality of their work, their subcontractors, and the products they recommend. If they don’t have a warranty, there might be a reason. Consider another option. Spend some time on the internet. See what type of footprint your contractor has left on the internet. Use resources like Houzz, Angie’s List, Facebook, and Yelp to better understand their professionalism and quality of work. Here’s a solid guide from Building Advisor about choosing a general contractor. This is an essential strategy for verifying your confidence in a contractor. If they have little or no internet presence, there might be a reason. Building a custom home is a wholly unique process, but some aspects are strikingly similar to a standard homebuying experience. The most common factor? Hiring a realtor. You may have a vision for your new home, but if you haven’t dialed in the specifics, you’ll need some professional help. Do you know the precise area in which you want to live? What about the square footage of your home? School districts, local zoning codes, and neighborhood guidance will also need a professional’s consult. Realtors can help guide and narrow the search, overseeing and negotiating the process of specific elements of the home throughout the process. However, we should make an important distinction early on in this process: there is a different between the builder’s agent and the buyer’s agent. The former is the agent representing the builder, who is considered to be the seller in the transaction. The latter is the agent who will ultimately represent you, the seller, and who can help get you want you want. Do you know and trust the builder? Building a custom home does not always mean “custom.” As we’ve discussed previously, there is a difference between a custom home and new home development communities. A custom home allows the buyer to have a say in nearly every step of the design process, while a new home development community build has a pre-selected range of building options. You may have already picked the subdivision of where you’d like to live, but you’re not completely “sold” on the home builder itself. This is where having a realtor will provide an advantage. Hiring a realtor to oversee your personal interests will help rein in the builder and maintain your preferences. Similarly, building a new home is an expensive process, and in a new development construction, the builder will likely oversee much of the construction and contracted work. If you don’t have professional real estate experience, you may not have the ability to know when a builder is overcharging for a service. A realtor, however, will. What about building a custom home? Building a true custom home—a home not associated with a new development community—will not likely necessitate the help of a realtor. Working with a hand-picked architect and contractor should provide all the guidance and consult you’ll need to get your project off the ground. However, there is one situation wherein having a realtor will be beneficial: if you haven’t found a lot. The realtor will be able to find and present a range of options suited to your needs. It also bears repeating that custom homes will cost between 20% and 30% more than other new homes. If you’re opting for this type of build, cost efficiency may not be the most important factor in the process. In most cases, a realtor’s fee is likely to be just a small cost of the overall build, so investing in this professional may be worth your time. How much of a realtor’s commission are you paying? For new construction and even custom home builds, using a realtor is not an all-or-nothing proposition. The real estate industry is experiencing a fair amount of innovation and diversification, especially for niche services and flat-fee rates. Most of us have heard about flat-fee listing services for sellers, but there are flat-fee realtors for all kinds of buyer and seller realty services. This can help buyers hone the services they want to prioritize while simultaneously saving money. What is the advice given to realtors themselves? When working on custom home builds, realtors are told to prioritize the client’s needs over all else—and to ready for debate with the builder’s agent. In a custom build, realtors understand that their primary role is as negotiator. It is the agent’s job to discuss financial decisions with the buyer; if they choose to not utilize an agent, they are taking a big risk with one of the largest investments of their lives. Realtors understand that buyers who opt out of working with their agent are not saving much, if any, money. The commission that would have been paid will instead go to the builder’s salesperson, or the builder will keep it as profit. Realtors prepare for and are familiar with unexpected costs, how timing will factor into the price, and how to move builders on their bottom line. So, is it necessary to hire a realtor for your custom home build? In most cases, having a consultation is an excellent idea. If you’re seeking a home in a new development company, can’t find a great plot, or are otherwise unfamiliar with the custom home process, having a realtor on your side is extremely beneficial. If you’re building a custom home with hand-picked contractors and architects, you won’t necessarily need a realtor, but having some kind of representation is always a good idea.